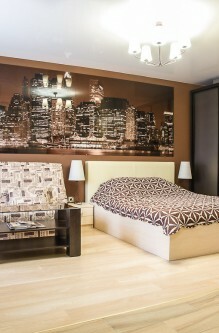 This nice apartment for rental is located in the center of Kharkov, near the Central Square. A nice and clean apartment includes a studio with kitchen and bathroom. Complete renovation. Apartment has pleasant interior, new modern lightening, furniture and amenities. Secure entrance door (combination lock), gas water heating system, shower cabin, washing machine, microvawe, satellite TV, CD, DVD player, big wardrobe, iron, microclimate system (air conditioner + air heater). The kitchen area includes a fridge, microwave, stove, and other basic kitchen necessities. 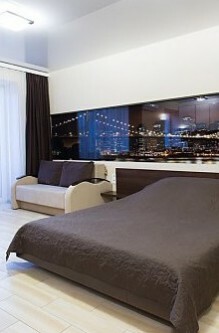 There are shops, travel agencies, restaurants, cafes, banks near apartment.